Located at the point in which I-35 E and I-35 W meet, Denton enjoys a unique spot in the Metroplex. Denton is approximately 40 miles from both Dallas and Fort Worth, completing the top of the “Golden Triangle” and connecting residents to all the museums, nightlife, and sports the bigger cities provide. Denton is very entertaining in its own right and regularly receives visitors from surrounding cities and towns. Although Denton continues to grow, the city strives to incorporate an active and outdoor lifestyle for its residents. A popular destination for both residents and visitors is the downtown square, which has been developed around the beautiful, historic Denton County Courthouse. The square truly has something for every age. The large lawn surrounding the courthouse is great for reading a book or throwing a Frisbee. The surrounding shops include local: restaurants, boutiques, wine bars, coffee shops, and live music. It even features Recycled Books Records CDs, a long-time local favorite. Denton maintains multiple parks, trails, a water park, and even a disc-golf course. The city is bike and pedestrian friendly, with many streets providing bike lanes and sidewalks. Residents enjoy 12 annual festivals, most of which are free, and the largest being the Arts & Jazz Festival held in the spring. Denton residents also enjoy a wide range of eating options from more familiar chains such as Chili’s and Olive Garden, to many restaurants and cafes unique to Denton. Another perk residents benefit from are the two universities located within the city. Denton is home to both the University of North Texas and Texas Women’s University. TWU offers a great nursing program, and UNT has an exceptional music program, which filters out into the city and is part of the reason a great show can be seen any night of the week and earned the city “Best Music Scene” in America in 2008 by Paste Magazine. 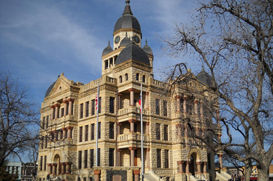 Residents have the convenience of residing in the Denton County Seat, and can easily handle legal matters, as all main county offices are located in the city. Students attend schools in the Denton ISD which is a “TEA Recognized School District,” and is home to very competitive high-school football teams. Denton has grown into a well-balanced city that encompasses comfortable living, business, the arts, education, and fun.